PAUL REVERE. Printed Document Signed. Boston, Mass., September 3, 1800. 1 p., Countersigned by John Bray, Enoch Baldwin and Joseph Clark (secretary). On vellum, with original red silk ribbon attached. 16 x 13, 31½ x 21½ in. 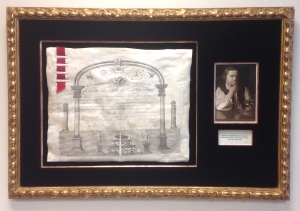 Documents relating to Paul Revere’s Masonry and his involvement with the Rising States Lodge are very rare. 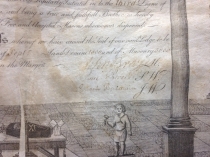 Here, the Revolutionary patriot and fellow officers of the Lodge certify that Moses Ward “has been regularly initiated in the Third Degree of Masonry” within the Rising States Lodge of Boston. In 1783, Revere and other Masons founded the Rising States Lodge. He remained a principal member for many years and from 1794-97 served as Grand Master of the Massachusetts Grand Lodge, the most prominent and prestigious position in the state. After 1800, the demands of Revere’s growing foundry business apparently absorbed most of his time; he held no further Masonic offices and only occasionally attended meetings. (E. J. Steblicki, Paul Revere and Freemasonry, 1985, p.64) The Rising States Lodge was dissolved in 1812. Paul Revere (1734—1818) was an American silversmith, engraver, and Boston patriot most famous for alerting the Massachusetts militia to the approach of British forces before the battles of Lexington and Concord. Born in Boston’s North End, Revere was prosperous and prominent, and took considerable risk when organizing the colonial resistance and intelligence networks. His almost entirely fictitious depiction of the Boston Massacre helped galvanize colonial resistance to British rule. He was a leader of the Boston Tea Party and served on the Boston Committee of Public Safety. He later served as a Massachusetts militia officer. Following the war, Revere returned to his silversmith trade and used the profits from his expanding business to finance his work in iron casting, bronze bell and cannon casting, and the forging of copper bolts and spikes. He became the first American to roll copper into sheets for use as sheathing on naval vessels.